Cled Frank lives in southern Davidson County, North Carolina on the farm where he was born over a hundred years ago. Cled grew up in a simpler time when there were no computers, no television or telephones or even radio. It was a time when he would go with his dad on the fourteen mile round trip to sell produce in Lexington. They would leave early and carry feed for the horse and when they'd get back home it would be dark. The young reporters who came to write stories about Cled on his 100th birthday could not really grasp what it was like. No one can. But Dempsey Essick can come close because Dempsey has always been fascinated with older people. To Dempsey, older folks are living history. He knows they have stories to tell and he enjoys listening. Frequently, their stories inspire him to do a painting that touches the life and times of the centenarian. Cled and Dempsey hit it off right away. Dempsey was interested in the accumulated bric-a-brack that Cled had allowed to collect over the years. Some of it stored in the old kitchen building that still stands out behind a newer house where Cled now lives. Dempsey was especially intrigued by a grey stoneware crock that was used in the old days to keep various foods such as milk or poultry, cool in the springhouse. This was in the days before electricity and refrigerators. 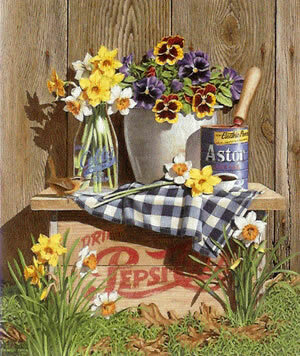 For his painting, Dempsey arranged some of his favorite spring flowers, pansies and daffodils, in and around the old crock. Then he assembled a few complimentary elements, a Coble milk bottle because Cled once worked at Coble, and an old coffee can found in a shed on the property. Dempsey's faultless depiction of the old wood siding is no more than collectors of his art have come to expect. Other touches, such as the casually folded tea towel and the perfect flowers are like an Essick signature. The delightful Carolina Wren is not only amusing but reflects the artist's love of songbirds. "Cled's Crock" fits right in with past Essick work. It is true to the artist's love of the rural settings of his homeland and reflects the attainment of the top level of American Artists.